China Halal Restaurants, China Halal Food, China Muslim Restaurants, China Muslim Food. Islam was introduced into China officially in 651 in the Tang Dynasty. Arabic traders married Chinese wives and a new ethnic group of Muslim Hui People was formed since then. General speaking, descendants of the intermarriage between Arabic and Chinese and Chinese who had been converted into Islam were the first group of Hui People (also called Huihui in ancient China). When the Muslim Hui ethnic group was formed, Chinese Halal food history started. In Western China’s Xinjiang Uyghur Autonomous Region, Halal food maintains primarily Middle East flavor while in East China, Halal food is mostly Chinese flavor. It was recorded that Chinese Halal food appeared as early as in the Tang Dynasty (618-907). Chinese Halal food became influential during the Yuan Dynasty (1279-1368) due to the fact that many Muslim soldiers were stationed in various parts of China. Some of the Halal snacks were even served in the Imperial court of Yuan and Qing Dynasties. Some of the time-honored Halal food names appeared in the Qing Dynasty. Yueshengzhai (most famous Halal food brand in Beijing) was opened in 1775 when it mainly sold spiced beef and mutton. With some Chinese herbs such as clove and fructus amomi added under the help of imperial doctors, Yueshengzhai spiced beef and mutton became well-known in Being not only for its great taste, but also for its nutrition and health functions. The staple food of Hui people is food made from wheat flower. When receiving distinguished guests, celebration of new born baby, wedding, during festivals of Hari Raya Puasa and Qurban, Hui Muslims will eat traditional food of Youxiang (a kind of fried bread). It is also very common to find all kinds of noodles made of wheat flower in Hui cuisine such as beef noodles, mutton noodles. 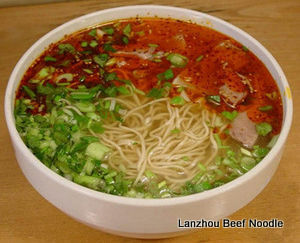 Lanzhou beef noodles are well known all across China. It was first cooked during the reign of Emperor Guangxu (1875 - 1908), Qing Dynasty (1616 - 1911). This dish has five main features: clear soup, white radish, red pepper, green caraway and yellow noodles. The noodles can be wide or slim to meet different preferences. Lanzhou beef noodles have gone beyond food to become a culture. 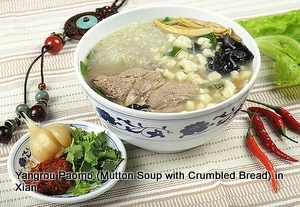 Xian’s Yang Rou Pao Mo (a soup dish that involves breaking wheat flour flat bread into a bowl and adding a delicious mutton stock) is another famous Halal food in China. Before dinning, you will be served one or two pieces of wheat flour flat bread which you need to break it into tiny chunks, the smaller the better. The waiter or the waitress will then hand your bowl to the cook who mixes the bread and mutton soup with an appropriate relish. The Halal Sheep Banquet is the second grand banquet in the Qing Dynasty Imperial Court only after the Manhan (Manchurian & Han) banquet. It was recorded that the Halal Grand Sheep Banquet had 72 varieties; it was served with either a bow or a plate. Though it was mutton, the flavor was very different. At the Halal Grand Sheep Banquet, they use all parts of the sheep and the cooking involves baking; frying; and boiling to bake. When naming the dishes, the word of sheep or mutton is avoided. 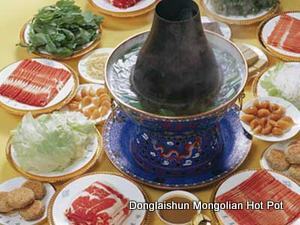 Donglaishun Hot Pot is another famous Muslim restaurant name in China and it has branches in almost all the big cities in China. A steaming pot is in the center of the dinning table. Donglaishun lamb hotpot features a savory, non-spicy broth. If that's not exciting enough for you, you can also request a spicy broth (be aware that this is flaming red, filled with peppers, and not for the weak!). Raw ingredients are purchased by the plate. In addition to lamb, beef and seafood, there are also a wide variety of vegetables, mushrooms, noodles, and tofu. A dipping sauce, usually sesame, is served as well; you can add chili, garlic, cilantro and many other spices to customize your own sauce. Since lamb is the specialty, every piece of lamb is specially chosen and carefully cut and processed. When it reaches your table, it is in red, thin slices that will cook in less than a minute. To cook any of the items on your table, all you have to do is drop it into the pot of boiling water in front of you and wait until it is cooked to your desire. Then just scoop it out, dip it in your sauce and enjoy! Xinjiang Uyghur cuisine which is known for cooking lamb kababs and handmade noodles is another wide-spread Halal food in China which can be found in all cities in China. 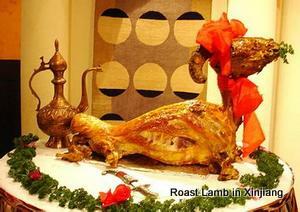 Xinjiang Uyghur cuisine is characterized by mutton, beef, chicken, onions. The primary dishes of Xinjiang Uyghur cuisine include boiled hand-made noodles with beef, mutton and vegetables; kebabs of beef or lamb and Zhuafan (Rice Eaten with Hands) which is cooked with ingredients from fresh mutton, carrot, vegetable oil and rice. The staple food of Xinjiang Uyghur cuisine is Naan or Nang in Chinese, a kind of bread cooked with sesame seeds, butter, vegetable oil and salt. Naan comes in more than 10 varieties and is roasted in a special oven which is made of mud and earth otherwise the process is similar to cooking pancakes. To run a Halal restaurant in China, Halal certificate is required. Usually Halal certificate can be obtained from the local Ethnic and Religious Affair’s Office of the city after necessary inspections. In some areas, Halal certificate is issued by mosques. Since China is not a Muslim country, it is hard for halal restaurants to survive if they don’t serve wines because most diners are non-Muslims. It is very common to see wines served at Halal restaurants in big cities like Beijing, Shanghai, Guangzhou, Shenzhen in China. However, in Northwest China’s Shaanxi, Gansu and Ningxi Hui Autonomous Region where you will see a large Muslim population, Halal restaurants are very strict on alcohol. Wines strictly prohibited at Halal restaurants in those provinces.